So, Kirstie-the-make-up-buyer has been on a serious mission these past two weeks. Yay for the blog.... not yay for the bank! I'm not sure what has come over me but I've just been in the mood to treat myself to a few new bits, I think it was the huge clearout I had... it made me feel like I deserve something new, which kind of defeats the object doesn't it? I'd seen a few girlies talking about this new palette on Twitter so I thought why not try it out for myself - plus it's currently on offer at Boots for only £3.99 instead of the usual £5.99 which persuaded me even more. 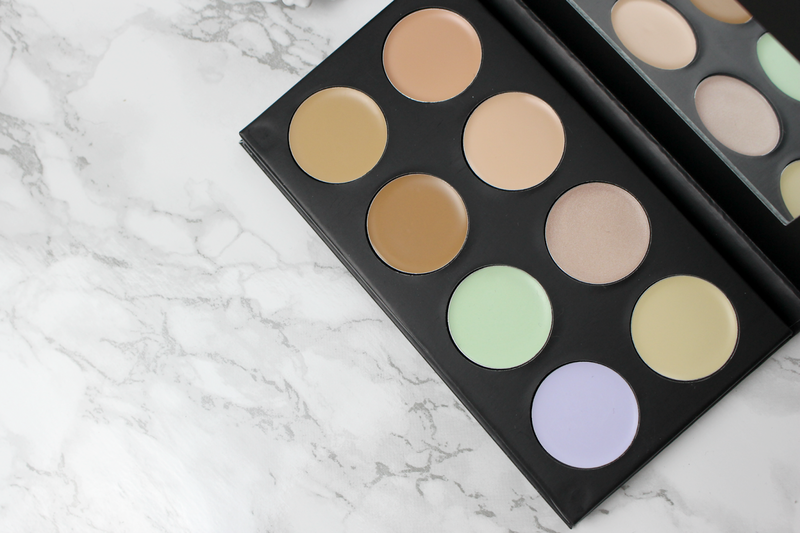 This palette contains 8 cream concealers! Yes - 8! Although I'm sure you have realised that from the photo above! The 4 concealer shades are to cover blemishes and imperfections - obvs - I've been using the second one in on the top row for any spots I have - thankfully... that hasn't been too many and I've actually been using the second shade in on the bottom row as a contouring shade, it's great! The yellow is fantastic for brightening dark circles under the eyes which is something i have seriously been struggling with so far this year. I'm sure the older I get the worse they are getting - or maybe I'm just sleeping less, who knows?! The green shade has to be my favourite, made for correcting redness in the skin this is a life-saver for me. Around my nose, my eyelids and sometimes under my eyes - this works wonders for toning down and hiding those problems areas that don't ever seem to want to go away. The highlighter is a lovely ivory pink shade great for using down the nose, under the brows and on your cupid's bow! Last but not least is the purple (lilac) shade which is used to revive dull skin - I haven't had the need to use this yet but like the other colours it is really light and creamy and blends in easily. All in all I think this is a steal - you'd pay £5.99 for any one of these on their own, so getting 8 for that price is a bargain! If you want to give it a go head to Boots quick while it's still on offer and save yourself £2! I really need to give this a try! I have this palette and love it, it's fantastic for the price.